Korean red ginseng, known to boost energy and often found in energy drinks, has recently been studied for improving facial wrinkles. In a 24-week study, collagen increased in participants that took three grams a day. Korean red ginseng also improved blood circulation when taking 1500 mgs for at least eight weeks – increasing blood flow also help wrinkles. Improving blood circulation is also beneficial to the heart, lungs, muscles, and oxygen flow to the extremities. Yoga has been studied for years for its multiple health benefits. One report I found touted that yoga is good for 107 diseases. I think it goes without saying, but I’m going to say it anyway, yoga is good for you. Yet there’s one specific study that really stood out – it reported that three months of yoga resulted in widespread improvement in cardiovascular and neurological function. The study maintained that yoga may prevent age-related changes to the heart, brain and autonomic functions. Time to Namaste. Click here to check out this article about the world’s oldest living yoga instructor. Her name is Tao, she’s 98 and has some great advice. The old adage, An apple a day keeps the doctor away was waaaay ahead of its time. The saying originated in Wales in 1860. The English version was, Eat an apple on going to bed, and you’ll keep the doctor from earning his bread. The reason why the quote was ahead of its time is because apples, apple juice, apple pectin and apple peel have the ability to prevent some cancers, while suppressing others. I have just touched the surface with this research. It’s going to need a full article because the benefits are unending. I just know I’m adding organic apples to my shopping list this week. P.P.S. Check out Judy Leighton, a long time reader of Anti-Aging@home, who is a pain and stress consultant and author. Along with her clients, they were able to quickly remove fear and pain from their flashbacks and memories and rapidly discover and release themselves from mental and emotional traps. They have a healthy self-worth now. They did this by using her healing method, books and CDs. Go to her website www.apathtolight.com to see. First read her engaging book, Journey into Light: Experience the Sunshine Method. Here’s a link to a brief newspaper article about this book: http://idyllwildtowncrier.com/2017/09/12/local-author-writes-book-long-invitation/ Enjoy! 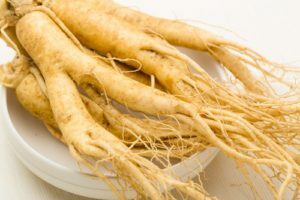 Cho S., Et al Red ginseng root extract mixed with Torilus fructus and Corni fructus improves facial wrinkles and increases type I procollagen synthesis in human skin: a randomized, double-blind, placebo-controlled study. J Med Food. 2009. Kang J., Et. al. Study on improving blood flow with Korean red ginseng substances using digital infrared thermal imaging and Doppler sonography: randomized, double blind, placebo-controlled clinical trial with parallel design. J Tradit Chin Med. 2013. Pal R., Et. al. Age-related changes in cardiovascular system, autonomic functions, and levels of BDNF of healthy active males: role of yogic practice. Age Dordr. 2014. Riccio G., Et. al. WNT Inhibitory Activity of Malus Pumila miller cv Annurca and Malus domestica cv Limoncella Apple Extracts on Human Colon-Rectal Cells Carrying Familial Adenomatous Polyposis Mutations. Nutrients. 2017. Hiroshige Hibasami, Et. al. Induction of apoptosis by three types of procyanidin isolated from apple (Rosaceae Malus pumila) in human stomach cancer KATO III cells. Int J Mol Med. 2004. Yang S., Et. al. Evaluation of antioxidative and antitumor activities of extracted flavonoids from Pink Lady apples in human colon and breast cancer cell lines. Food Funct. 2015. Liu RH., Et. al. Apples prevent mammary tumors in rats. J Agric Food Chem. 2005. Liu JR., Et. al. Fresh apples suppress mammary carcinogenesis and proliferative activity and induce apoptosis in mammary tumors of the Sprague-Dawley rat. J Agric Food Chem. 2009. Jie Sun, Et. al. Apple phytochemical extracts inhibit proliferation of estrogen-dependent and estrogen-independent human breast cancer cells. J Agric Food Chem. 2008. Fabiani R., Et. al. Consumption of apples is associated with a reduced risk of cancer in different anatomical sites. Public Health Nutr. 2016.